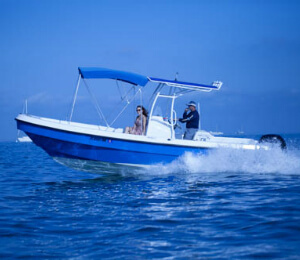 17 foot Seafox center console boats are best for small groups of 3 or less. These are paired with a 75HP outboard which is a great matchup for this vessel! 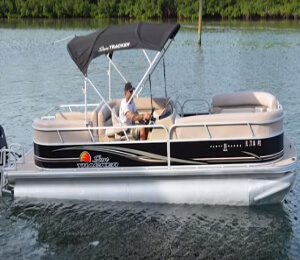 A bimini top covers the console for shade while you zip around the shallows of Key West. Coast Guard equipment, GPS, and VHF are all included as well. 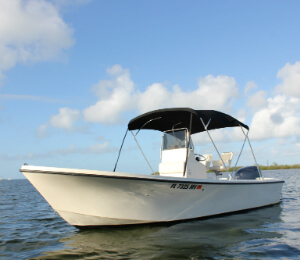 The 22' Angler Center Console 150HP with bimini top, is one of our most popular rentals! Bring your family or friends and explore Key West from the water. The views are awesome and you never know what you will encounter. This boat handles the ocean waves like a pro, and will get you and your party to where you need to go. Rent a 22' Cobia for a half day, full day, 3, 5, or 7 days, or even longer if you need. This boat has a 6 passenger capacity and a bimini top. 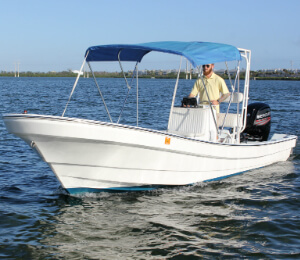 The 22' Panga is a center console which can hold up to six passengers. Take your party out to explore the open waters around Key West, and snorkeling as you please, or perhaps take a romantic getaway to have a picnic on a secluded beach. The 22' Parker can hold up to six passengers. 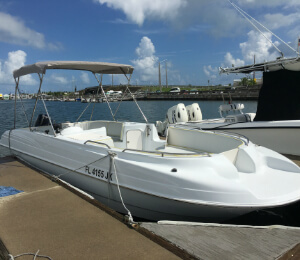 This boat is perfect for taking friends and family out for a little adventure of island hopping and fishing for the day. 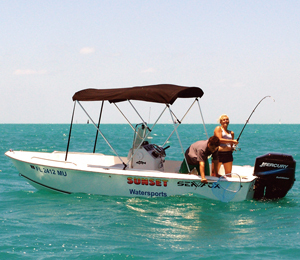 One of Key West's best boat rentals offers great amenenties like GPS and Depth Finder for finding the best spots. The 26' Rendezvous is our newest deck boat which can hold up to 10 passengers. If you're ready to go and don't need a guide, boat rentals are for you! Bring the family and enjoy the freedom of coming and going as you please. 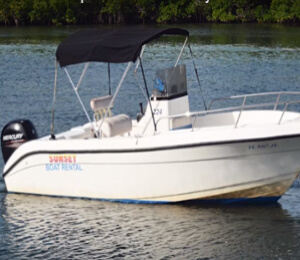 This boat is available for half day and full day rentals, as well as 3, 5 or 7 day rentals! A Pontoon boat is a great way to take your group of 12 or less out for a leisure day! Head out to snorkel the reefs, check out the popular sandbar area, do some fishing, or enjoy a day of cruising around and observing nature and wildlife that are native to the Key West area.